The purpose of our business is to help successful people and businesses organize their financial affairs and plan for their future. We work in a wide range of areas including investments, life and disability income insurance, long-term care insurance, and retirement planning. We have a highly structured yet personalized approach to financial planning. We spend a significant amount of time discussing your financial goals and objectives, risk tolerance, and time horizon to develop a well managed, tailored plan that meets your personal needs. We meet frequently with our clients to reassess their financial goals, as well as to review their current financial programs. I have a highly skilled and well-credentialed staff, who assist me in helping our clients achieve their financial security. My commitment to you is to listen to you so that I can help you achieve financial security for your family or business. I will work with you to help you identify your financial goals, suggest a strategy to help you reach those goals and work with you to implement during your lifetime. Contributing to the community is a way of life for Sharon Zimmerman. In honor of the work she does with Social Advocates for Youth, Zimmerman has been awarded the 2014 and 2018 Community Service Award by the Northwestern Mutual Foundation. As part of the award, Social Advocates for Youth received a $25,000 grant for 2014 and $15,000 grant for 2018 from the Foundation in Zimmerman's honor. 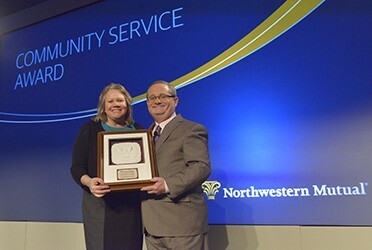 The award is presented annually to 16 Northwestern Mutual financial professionals who demonstrate exemplary service with a local nonprofit.